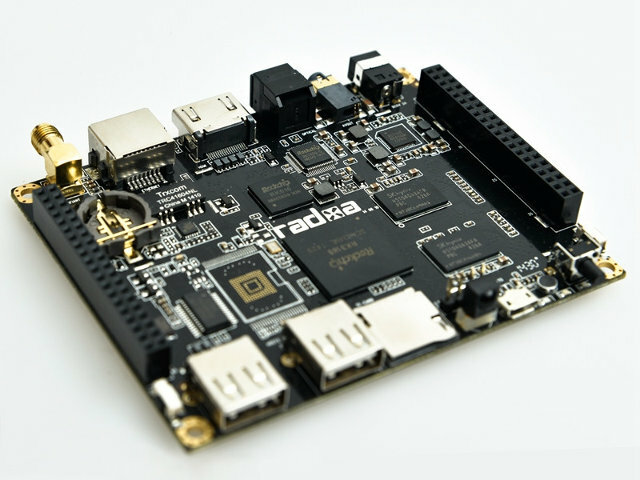 When the new Radxa Rock Lite was announced for $59 in September 2014, it was one of the most inexpensive quad core ARM Linux development board available on the market. But ODROID-C1 board in December 2014, and especially Raspberry Pi 2 board in February 2015 changed all that, as these two quad core boards sell for $35 before shipping and taxes. So the company has now decided to drop the price to $39 for the Radxa Rock Lite board. Video Output – HDMI 1.4 up to [email protected], and AV output. LVDS interface. The board can run various Linux based operating systems like Android 4.4, Ubuntu, Debian, and so on. 3D graphics acceleration should be supported in the desktop OSes, but video decoding has to rely on software decode, except in Android. The quad core Cortex A9 processor @ 1.6GHz will have much better performance than Broadcom BCM2836 quad core Cortex A7 (900 MHz) found in R-Pi 2, and even the Amlogic S805 quad core Cortex A5 (1.5GHz) found in ODROID-C1 that about 40% faster than R-Pi2. Rockchip RK3188 can deliver 16000 DMIPS, against 9420 DMIPS for Amlogic S805, and 6840 DMIPS for Broadcom BCM2836. So if your application require high integer or floating point performance, and/or Wi-Fi (built-in) / RTC or LVDS, Radxa Rock Lite might be a better deal. Bear in mind that the community should be quite smaller than for the other two boards. It would be great if it had SATA connector.. I supose that this “lite” variant has the same problems with bootloader and propietary blobs that his greater sister. Isn’t it? hardware decoding for rk3188 under linux will come. Correct me if I’m wrong, but the board supports LCD RGB as video output interface. At Radxa store there is 7inch LCD which (i think) connects to board via LCD RGB. Today it isn’t important expect one thing – LCD could be easily converted to VGA output with r2r resistors set or with ADV7123 (or its chinese clone GM7123).